World Autism Awareness Week runs from 26th March - 2nd April 2018 and I'm bursting to share with you all about our journey with autism. One large part of that is all the books and information which has been digested along the way. Yesterday I shared with you a new release called 'Autism - How to raise a happy autistic child', but today I would like to show you one of my all-time favourite books about autism. 'What We Love Most About Life' is a book which was pulled together and published by Chris Bonnello. 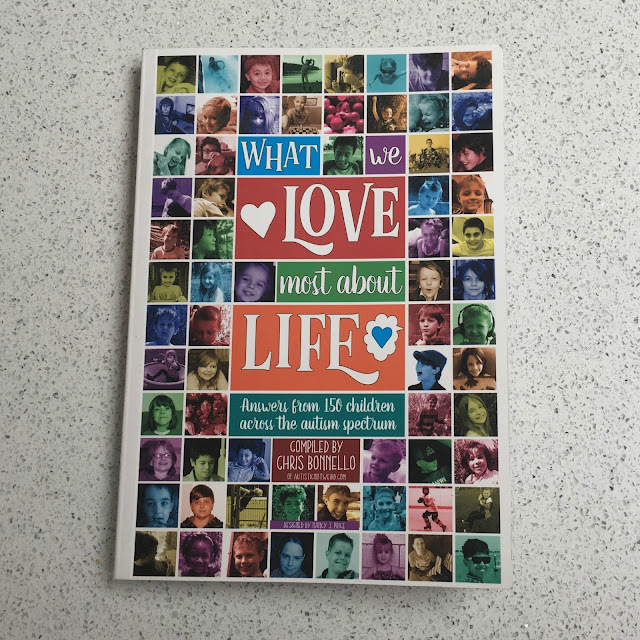 Chris runs a very successful website called Autistic Not Weird, and a couple of years ago he had the amazing idea to create this book in order to spread some positivity on the subject of autism. He connected with 150 children across the autism spectrum, a variety of ages and genders, and asked for their answers to the question on what they loved about life. 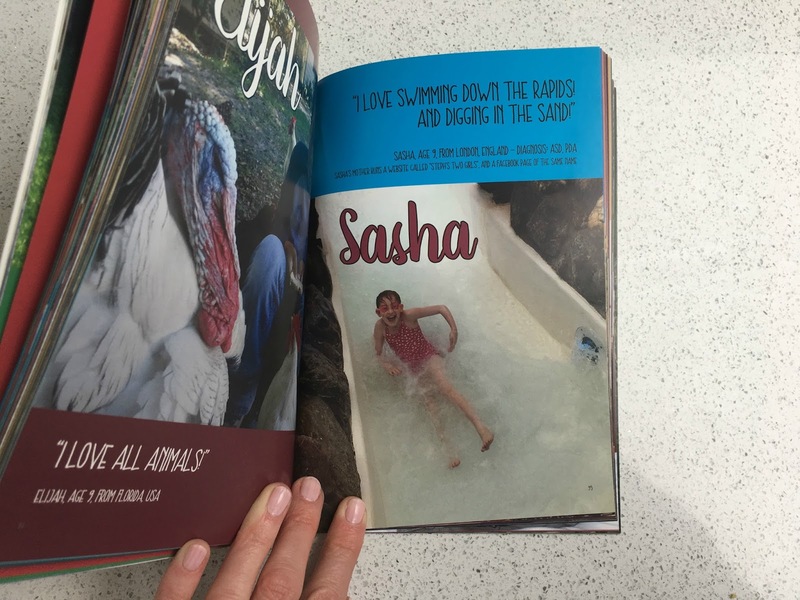 Sasha features on page 95 of this book and of course I am very proud to see her in there. I dip in and out of the book most weeks, as there are so many amazing answers. It's clear that every child is unique, and it's also clear that there is much love for life. Some answers come from non-verbal children or those with limited understanding, so parents have guessed what their answer would be based on what they show that they love on a daily basis - communication is not always verbal after all. Back then, Sasha would not engage in answering a question like that, so I took her interests at the time and used that in a phrase, along with a picture of Sasha in one of her happiest places in the world (the rapids at Center Parcs). I always hoped that she would be able to answer the question for herself in future years, and in time she might. About a year ago I used the book as a tool to start talking to Sasha about autism, when I felt the time was right. I wrote a blog post about that entitled 'How to tell your child they have autism', but it occurred to me recently that I didn't give an update about what happened next. I left the book in Sasha's room, and after a few weeks I could see that it had been looked at, so I asked her if she had enjoyed it. Her response could probably be classed as a grunt, but with a twinkle in her eye. She's not big on question and answer sessions... I'm pretty sure she had leafed through it though. In my head, I imagine that after so long in a mainstream school where she didn't feel she fitted in, it must be nice for her to feel that she is part of a group of other people who are all autistic too. Sasha has many extreme anxieties and fears, ranging from travel to weather and natural disasters, but despite the challenges we all face in the light of those, she still does love life and is mostly positive and bubbly. She brightens my life of course, and has taught me much about her own particular 'brand' of autism (have I mentioned PDA before?! ), which in turn has led to me developing a broader understanding of what autism means. I hope that by sharing on social media, I can share that understanding with others and make this world a more accepting place overall.